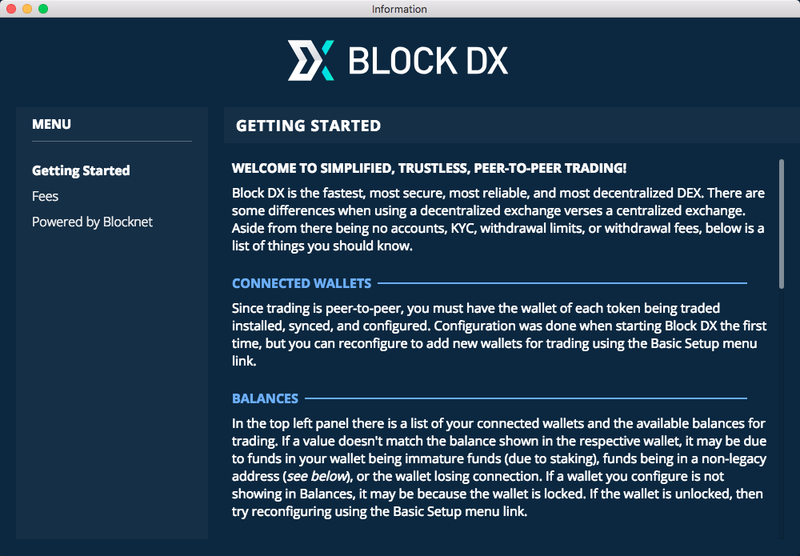 Block DX version 1.0.0 and wallet version 3.12.1 have been released with many improvements and new features. Full details on these updates can be seen below. Note: This wallet release runs on a new Blocknet and XBridge protocol version. As a result, it is mandatory for everyone to update. IF YOU DO NOT UPDATE YOU WILL END UP ON A FORK. If you do not update, you will not be able to stake or make withdrawals to exchanges. These latest wallet and Block DX releases are the most important releases to date. They represent the point at which we are ready to begin a large marketing outreach including articles, planned grassroot initiatives, a relaunch of Coin Announcements, and collaboration with previously announced projects. This will be accompanied by market makers to increase liquidity on Block DX and BLOCK airdrops so new users can begin trading right away. Block DX is the fastest, most secure, most reliable, most user-friendly, and most decentralized DEX. It is the first dApp powered by the Blocknet Protocol, a 2nd layer blockchain interoperability protocol that enables communication, interaction, and exchange between different blockchains. Read more about the Blocknet Protocol. This Blocknet wallet has considerable improvements to XBridge reliability, security, and resilience. Due to the various changes in this release, this update includes a new Blocknet protocol version 70712 and an XBridge protocol bump. You will end up on a fork if you do not update to this new wallet. Let’s take a look at some of these changes. Note: Service Nodes need to issue the `start-all` command from the 5000 BLOCK collateral client after updating both the node and the collateral client. Service Nodes will also need to update their configuration files. Improved wallet syncing time to roughly twice as fast. The change in the Superblock amount to 40k BLOCK has been implemented and will take effect on block 820,800. Testnet 5 has been created and is the now the primary testnet. Checks have been added to make sure Service Nodes have seen the order before processing. Improvements to the Service Node list stability, including: 1) Newly started Service Nodes only need to wait 135 minutes to enter the queue instead of 20 hours, 2) Service node vin must have confirmations in excess of total number of Service Nodes on the network 3) Recently started Service Nodes are no longer part of the ranking. All Service Node orders will now be cancelled on shutdown. Improved UTXO selection algo, maker UTXO verification checks, trade fee verification checks, and trade locktime drifts. Multiple fixes for order states and UTXO filter such as an improved and simplified order cancel process, properly excluding trading fee UTXOs across all orders, and setting the rollback state at the time of cancelation. Improved refund address handling where the refund transaction spending of the trader’s deposit back to himself after locktime will prioritize selection of the refund address in the following manner: 1) Using the from address on the order, 2) using the largest UTXO input address for the order, and 3) using the wallets getnewaddress RPC call. New disconnectpeer RPC command to disconnect from a peer by specifying the peer ID from getpeerinfo. Fixed dxgetorderhistory call to not mix historical orders from cache, open/close/high/low determination, and changed volume to report denomination in the maker’s market. Fixed getbalance RPC crash on account alias, missing exchange enabled check, remote activation, dxLoadXBridgeConf bug, state verification and fee checks, order cancellation checks, and logging to include deposit P2SH lock times and accurate fee amounts in fee checks. Pulled in various upstream updates. Block DX development has completed many initiatives to improve the user experience throughout the app. This newest update requires the latest Blocknet wallet (3.12.1). Note: You will need to go through the configuration process again if updating from a previous Block DX version. 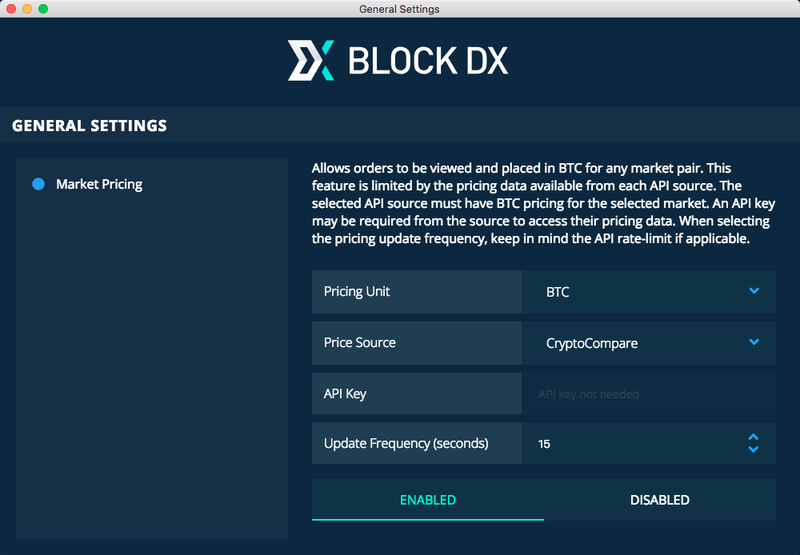 Block DX now has an in-app updater. This updater will notify you when a new version is available and let them easily upgrade from within Block DX. Prior to the feature, you would have to manually check for updates or follow Blocknet announcements. This allows everyone to stay up-to-date in a convenient and seamless manner. There are now additional informational screens providing you with more resources. The most notable is a Getting Started screen that welcomes new users the first time they open the app. This screen provides essential information to help onboard these new users and will provide a better first experience. 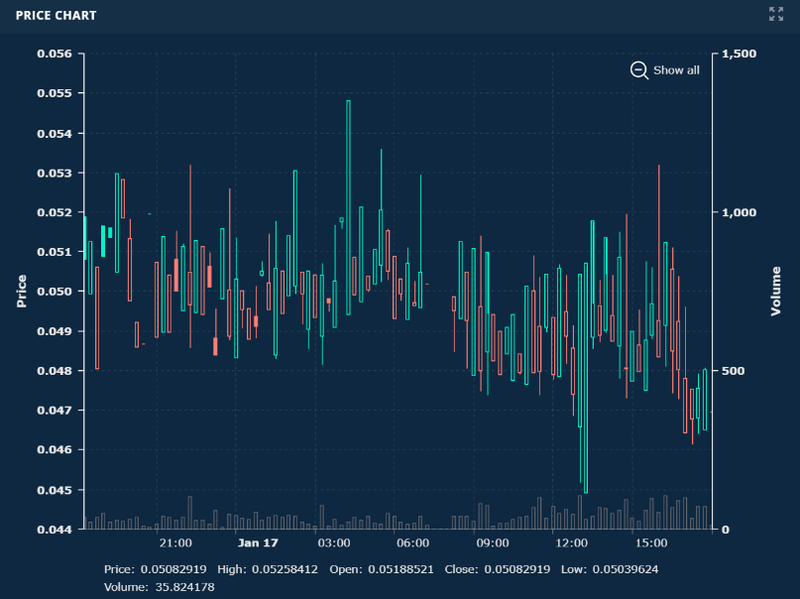 The price chart has undergone various improvements including a new candle design, a volume bar chart, a legend to display the data of the information under the crosshairs, an active zoom to automatically focus on the relevant price range, and the ability to manually zoom in on a specific period. The depth chart was redesigned to have it fill the entire panel, always have the mid-market vertically centered, and use a gradient background for better visual appeal. The chart was also inverted to that the sell orders are on the top to align with the order book orientation. The order book has also been overhauled. Based off user feedback, the buy and sell orders were split into two separate scrollable lists so they can be navigated independently. Also due to popular demand, the ‘own-order’ indication has been improved. 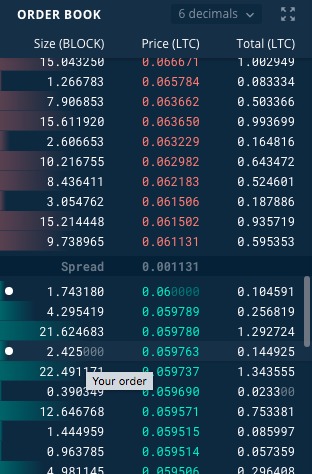 Any order in the order book that you created has a leading white dot and hovering over this order displays a tooltip letting you know it is your order. In addition to these items, columns have been rearranged to show the size column first since this is the most important column when taking exact orders. The colored bars indicating the order size have been scaled to remain contained within the left side of the panel. The ‘my orders’ section has been redesigned as well. The tabs have been renamed from ‘Open Orders’ and ‘Filled Orders’ to ‘Active Orders’ and ‘Inactive Orders’, respectively. With this, the Active Orders tab has been updated to show only open orders, in-progress orders, or orders that need action. The Inactive Orders tab shows all inactive orders including completed and cancelled orders. The way order state is presented has also been improved. Block DX now uses more user-friendly status descriptions and status symbols to better indicate the state of the orders. A tooltip with the order state also shows when hovering over any part of the order now. Improvements have been made to the order history panel including rearranging the columns to place Time in the first column, addition of the order total, coloring of the values indicating whether it was a buy or sell order, and fixing a bug that was causing rounding errors. The Time value logic has also been updated to show the hour, minute, and second of orders taking place on the current day and show the date, hour, and minute on orders taking place on a day other than the current day. Market pricing allows you to view the pricing of any market in terms of BTC. This is valuable to traders because it allows a better understanding of pricing for uncommon pairs such as Syscoin/Dash, which is important since Block DX has complete market pair freedom and any compatible digital asset can be traded for any other compatible digital asset. This tool also helps with spotting arbitrage opportunities between various markets. In this update the default price source has been changed to CryptoCompare since it doesn’t require you to provide an API key. The default frequency for updating the price has been reduced to 15 seconds. The UI has also been updated to indicate when an API key is required and provides feedback when trying to enable this feature without an API key. Coming across errors can be frustrating and even more so when you have no idea why they are occurring. To provide a great user experience, improved error messaging has been implemented to provide the user with information on what the issue is and tips to resolve these issues. Other changes include updates to the menu, text changes, and bug fixes with the market pair statistics data (information above the price chart). There are many exciting milestones still ahead including the official beta release of XRouter and market and limit order functionality. View the roadmap. Blocknet will continue breaking new ground as we move through 2019. Be sure to keep up with the latest developments by joining the Blocknet community on Discord and subscribing to the biweekly newsletter.